Preface. Hepatitis A (N. Previsani, D. Lavanchy, G. Siegl). 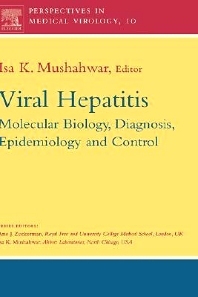 Hepatitis B (N. Previsani, D. Lavanchy, A.J. Zuckerman). Hepatitis B virus mutants: Emergence and impact on diagnostic detection (P.F. Coleman). Hepatitis B virus: Life cycle and morphogenesis (L.G. Birkenmeyer). Hepatitis C virus (A. Scott Muerhoff, G.J. Dawson). Hepatitis Delta (N. Previsani, D. Lavanchy, M. Rizzetto). Hepatitis E virus: Current status (G.G. Schlauder). GB virus C (T.P. Leary, I.K. Mushahwar). Torque Teno virus (TTV): Molecular virology and clinical implications (H. Okamoto, T. Nishizawa, M. Takahashi). List of contributors. Index. The last forty years have witnessed the discovery of five human hepatitis viruses: hepatitis virus A, B, C, D, and E, and two related blood-borne viruses: GB virus C and TT virus. Viral Hepatitis provides a comprehensive overview of the latest developments and research studies in human viral hepatitis. Written by leading international scientists in the field, this book covers topics ranging from the history of these viruses to their molecular biology, diagnosis, epidemiology and control. It will be an invaluable reference source for hepatitis researchers, reference and diagnostic laboratories, clinicians, public health officers and graduate and medical students. Dr. Mushahwar is a Fellow in the Infectious Disease Society of America and on the Editorial Boards of the Journal of Virological Methods, Journal of Medical Virology and Journal of Clinical Microbiology. He is a member of the American Society for Biochemistry and Molecular Biology and the American Association of Immunologists. He has authored over 180 articles in major scientific journals, 40 book chapters and also, an editor of three books. He has been an invited lecturer and scientific co-chairman at many national and international scientific meetings. Dr. Mushahwar joined Abbott Laboratories, Diagnostics Division in 1974 where he developed many diagnostic assays for hepatitis viruses, upper respiratory, congenital and sexually transmitted diseases. During the nineties, he directed the viral discovery group that identified and characterized three new flaviviruses, namely, GB virus A, B and C, several new hepatitis E virus genotypes from the United States, Italy, Greece and Argentina as well as new HBsAg mutants.